As an engineer I love all things that are shiny and blinky. Like many other engineers I am a cubicle dweller. I wanted to create something in my cube that would brighten up my workspace and make me smile whenever I’m working there. What follows is a series of posts that will guide you through how I designed and built my version of the LED Bridge Lamp which is based off of the LED Bridge Lamp (Universal Segment) by my friend Janis (Opossums) Jakaitis on Thingiverse here. It was a great looking project and would be the perfect addition to any cubicle in need of some blinky. 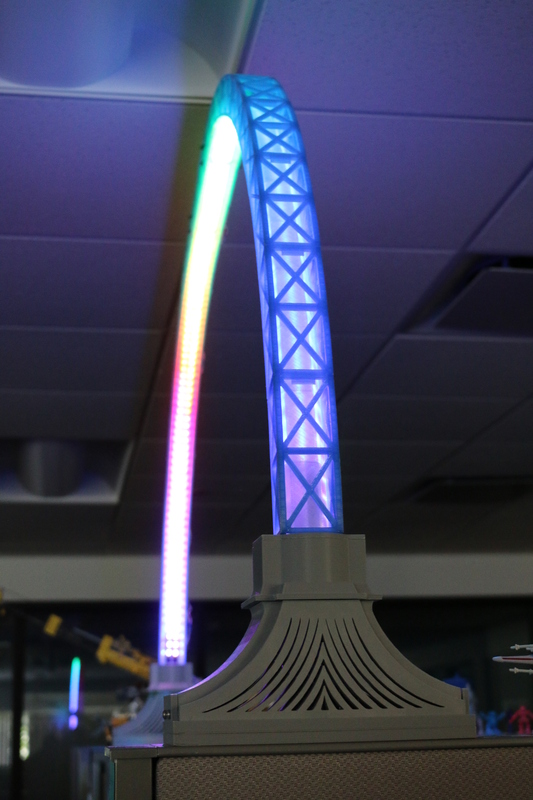 Side view of my LED Bridge Lamp running a rainbow animation. You can find the 3D models I used to build this project on Thingiverse here. They are free to download, use and modify. How long did this take to build? Total Print Time: 145 hours! NOTE: The above does not include printing another 25 segments of straight superstructure and light shades, misprints, having 8 segments of assembled PLA superstructure melt by being too close to a radiator, test prints and re-prints. I estimate that I have something around 300 hours into this project. For additional posts related to this project check out this the ‘LED Bridge Lamp’ tag. I’ll be adding more posts giving details on how I built my version of the LED Bridge Lamp. 🙂 When you are next in Westford, let me know and I am happy to show you.